There is nothing worse than having your child get sick with painful tummy problems. Kids tend to have a higher risk of getting digestive health-related diseases such as diarrhea and constipation from harmful bacteria. A stomachache isn’t only uncomfortable; it alters the child’s mood and his or her attitude for the day. As a parent, this definitely causes emotional stress because we don’t want to see our kid experiencing any kind of discomfort. What are probiotics and why do your kids need them? Experts say probiotics may help ease your child’s digestive disorders and make potty training more manageable. What are probiotics, which have been showing up in a lot of kids’ products lately? As a mom, you want to know what probiotics are and which one to choose for your child. Probiotics are live microorganisms that help maintain the balance of good and bad bacteria in the digestive tract. It works like this: A human digestive tract has about 100 trillion healthy bacteria. Bacteria aid in digestion and help the body defend itself against illness2. Thus, probiotics can aid with immunity and help protect you from common colds and flu. Every person, child or adult, needs a balance of good bacteria in the body. However, this balance is easily upset by a number of factors such as a poor diet, stress or by taking antibiotics and other medication. It’s a good thing there is Erceflora ProbiBears, a yummy tummy supplement with the combined 2-in-1 PROBIO-BOOSTER of not just Lactobacillus acidophilus, but also Bifidobacterium lactis – good bacteria that help prevent gut problems such as diarrhea, upset stomach, and other digestive illnesses to help keep kids happy and healthy every day. It’s the delicious and healthy way to strengthen your child’s tummy in yummy chewable bears! 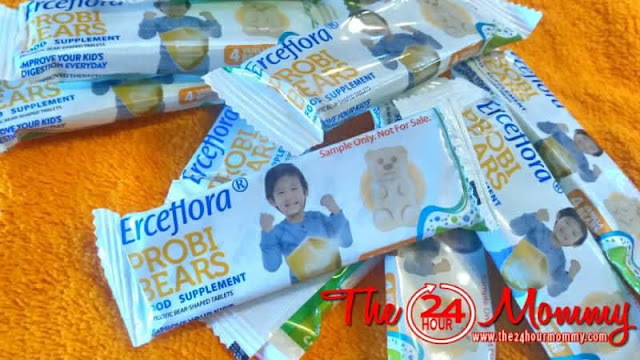 From the makers of the World’s #1 Probiotic, ProbiBears will reassure moms that their kids stay healthy in the tummy! Moreover, their kids will love it because it comes in fun and yummy chewable bears! Erceflora ProbiBears will be available in Mercury Drug by June for only Php540 SRP per Box of 20s. Make sure you get your supply by then to get your kids ready for the busy school year!